Some people will see this film and think it’s an amazing piece of cinema. Some will see it and find it dreadful. Both views are correct. 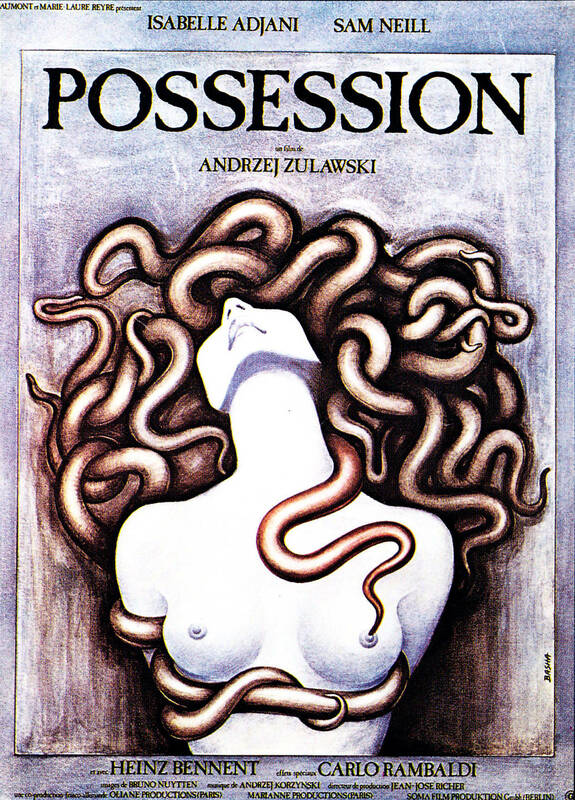 Depending on my mood when I saw Possession, I could find it falling anywhere between those two extremes. It’s… a difficult one. People throw around the term ‘mindfuck’ for films with clever twists or disturbing ideas – I think I will now ask anyone using the term how those films stack up against Possession, because I’ve seen few films as psychologically gruelling as this one. Most of the characters in the film are unlikeable and strange. This is something I’ve complained about in other movies and yet here it is also kind of the point. Early in the film we get to watch to odd, troubled, and unsympathetic characters as their marriage disintegrates horribly. It’s awful in all the ways it should be and a very uncomfortable watch. From there it spirals into madness. Hard to tell if it’s the film-maker’s or the characters’ or the breakdown of the universe. Despite the title, you’re (probably) watching allegory. Full credit has to go to Isabelle Adjani for playing her part as the disturbed, and disturbing Anna, with such unflinching, unwavering, mania. There are long, long sequences where she will act out what must have been a truly exhausting scene, physically and emotionally, without the camera ever cutting away. The scene in the subway quickly gets past uncomfortable, moves on to gruelling, and keeps on going way beyond that. She won awards for this and other films, and I’m not surprised. She’s an amazing actress. Sam Neill does a solid job too, as Mark, who spends much of his time broken and unlikeable. His mood and attitudes vary, but you’re never completely on his side even when his wife is cruel to him. Credit too must go to writer/director Andrzej Zulawski for filming long unbroken takes which give things a visceral quality. It’s a bit like watching a car crash, you can’t tear your eyes away as events unfold infront of you in terrible and unexpected ways. One of the things I like about it is that it doesn’t give you any answers. You can’t tell if it’s real, if the film is from the point of view of the madness of its characters, or all shot in Symbolism-Vision. It’s a film that more than earns its right to be called a mindfuck movie, and depending on your mood you’ll hate it or appreciate it, but you probably won’t like it. I’ve seen several reviews by people who said they felt violated by the movie. It’s a strong term to use, but I can see exactly where they are coming from. It’s not a nice film, and it will likely stay with you. I could easily have given it anywhere between 9/10 or 6/10, in the end I settled on 8 because that’s what I feel at the time of writing. Ask me again tomorrow, it will probably get a different score. I never want to see it again, and yet I will probably buy a copy because it truly is an amazing piece of cinema that, when I feel strong enough, I will certainly want to revisit. This entry was posted in Cosmic Horror, Film/TV and tagged Cosmic Horror, Possession by dalekboy. Bookmark the permalink.